In a conventional camera lens, the iris consists of a set of overlapping mechanical blades that control the amount of light entering the camera. As efficient as this mechanical system is, it is too bulky and too difficult to miniaturize to be incorporated in smartphones and other compact mobile devices. 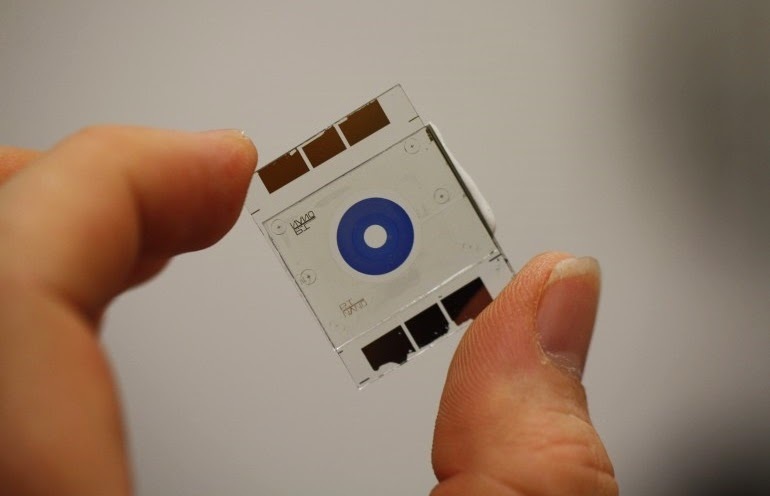 To address this, a team of researchers has used "smart glass" to create a micro-sized electronic iris that may bring much greater image quality and flexibility to smartphone cameras. The researchers, from Germany's University of Kaiserslautern, created their non-mechanical iris using an electrochromic material like that used in the View Dynamic Glass windows. In this case, the material consists of various polymer layers that turn opaque when a small electrical voltage is applied. Each of these layers is configured as concentric rings to provide varying degrees of aperture to simulate the behavior of a mechanical iris, with each of the two segments able to be controlled to produce four possible switching states. In effect, this provides a range of f-stops similar to that found in a mechanical iris lens. "There is currently no technological solution available that meets all the demands of integrated iris apertures in smartphones," said lead author of the research Tobias Deutschmann. "Many of the proposed devices require the motion of a strong absorbing material to block the path of light. Electrochromic materials, as used in this study, remain stationary whilst they change their absorption, so there is no need for any actuation. This allows for much smaller casings to fit around the devices and thus enables the integration into tiny camera systems ... this is the decisive hardware parameter which determines the success of next-generation models in the smart phone business." In addition, the team claims that each of the segments does not need a constant current applied to remain opaque, so power consumption is predicted to be very low (claimed to be approximately 30 μW); a feature that bodes well for future use in portable devices. And, according to the designers, by being able to precisely tune each segment in proportion to the voltage applied, the light transmitted through the iris is evenly distributed and tightly focused, thereby ensuring that images remain sharp and clear. The only real drawback of using electrochromic material in the studies so far is that of reaction time – according to the researchers this is still in the region of seconds – which will need to be addressed before the "smart-glass" iris could be released as a commercial product. However, the researchers state that they also hope to decrease the switching time by eventually incorporating new electrochromic materials currently being developed.